The Promised Kept is a book written my Michael Pungercar. Mike has been a member of the 91st Bombardment Group since June 2011 and is a member of the 91st BG Memorial Association. If you are a history buff, are interested in World War II, the Air War over Europe, or a fan of the B-17 Flying Fortress, you will enjoy reading this book. In World War II, the Eighth Air Force sent up thousands of men into the skies over Fortress Europe. Stories have been written about the fighter pilots who took on the mighty Luftwaffe one on one. And many stories are about the pilots, gunners, and bombardiers who manned the bombers that flew their missions through the flak filled skies. This book is the story of a man who served with the 91st Bomb Group, and who was like the other men who found their life and their world changed by the greatest conflict in world history. His story, and stories of other airmen and ground crew personnel, are brought to life with the aid of over 100 photographs from WWII. In reading this book, life with the 91st Bomb Group is relived as the author walks in his father's footsteps. Published by Outskirts Press , Denver, CO.
330 pages illustrated with over 200 photos, many never published before. Available on Amazon.com and Barnes& Noble.com. This book was the fulfillment of a promise Michael made to his father before his father passed on. He promised that he would record his father's experiences gained while the senior Pungercar flew with the Eighth Air Force in the air war over Europe during WWII. Initially, it was so that the family would know what he had gone through. He took it one step further than writing a short history for the family, and this book is the result. Not only is this a family record of one man's experiences, it is an excellent historical record about that period in time some seven decades past. Michael has expanded on his father's personal experiences and interlaced them with a well researched history of the 91st Bomb Group of the 8th Air Force. The "Mighty Eighth", as it came to be known, was the culmination of the attempt to take the war to the heartland of Nazi Germany. This book covers this period, especially as it pertains to the 91st Bomb Group, in an interesting and gripping read. The research and personal stories are wound together in a very readable format that will keep even the uninitiated interested from start to finish. 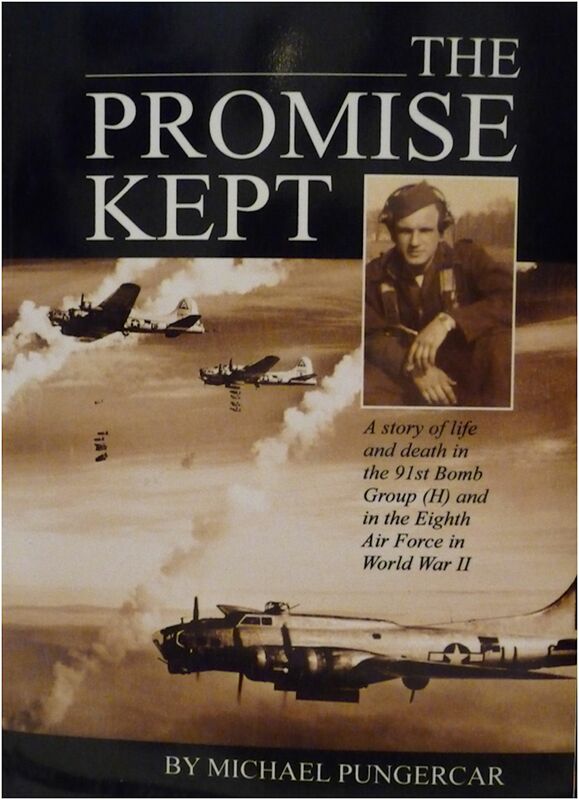 "A Promise Kept" covers the history of the 91st as it was formed and dispatched to Europe in late 1942. The 91st was one of the first four groups sent to England as the vanguard of the air war against Hitler. Follow the birth of the air war, to the first unescorted raids when fighters were a menace, up to the latter stages of the air war in 1944 and 1945 when the "Little Friends", the P51 fighters, escorted the bomber groups deep into the German heartland. The background history and facts and figures that have been provided really add to the feeling the reader gets that they are reading history as it happened. Add to this the 100 or more photos of planes, airmen, and bomb missions, and one gets a real feel for the air war as it unfolded. Michael was lucky enough to interview a number of veterans who chose to share some of their more intimate experiences. He combines the interviews with historical facts and background, and the photos with missions. Not much is left to the imagination. It is all there, and I challenge anyone who has read this book to say they have not come away with a better understanding of what these men had to endure during their time overseas. If you have an interest in WWII, especially as it pertains to the Eighth Air Force and the air war over Europe, then buy this book. It belongs in your history collection. Congratulations on a job well done, Michael. You have done your father proud, and kept the promise you made to him, and then some.